French to English translation is something that should be handled by a translation expert – especially when the source documentation relates to legal issues. Amongst files that are difficult to translate, anything that relates to legality can be an extremely challenging translation. Why is this the case? Well, it's not just about finding the correct words or phrases to properly translate the meaning. There can also be cultural differences that change how we translate certain words. It's why when it comes to legal documentation, you need a language translator who is a translation and legal expert. To translate is not to perform maths or science. The mere concept of translation is a social phenomenon that could not exist without society, but it is also a cultural one too. As such, any language translator of legal files needs to create translation work that is accurate, coherent, cohesive, understandable, contextual and intertextual. The last requirement is something that can be ignored in many translations. In legal text, however, intertextuality is essential to translating legal phrases. All over the world, legal systems are dependent upon legal dictionary phrases, cases, precedents and examples. Without knowledge of other texts or dictionary phrases within this system and what they mean, a professional French to English translator without legal experience could make serious mistakes in a text due to misunderstanding the intertextuality of the original document. After all, we don't exist in a vacuum – translations make sense to a culture in today's terms. The same goes for legal issues. Archaic terms that can be found in many legal documents can create issues for an experienced French to English online translator with little to no legal experience. The main concern for a translator of legal text is that they translate the 'realia' which is Latin for 'the real things'. By realia, we mean words – or phrases and words – that translate the society, culture and history of a particular nation. These are words or phrases that could only be truly understood by those who can translate the mother tongue of a nation. From the legal translation perspective, this is someone who can translate the 'realia' of a nation's legal system. 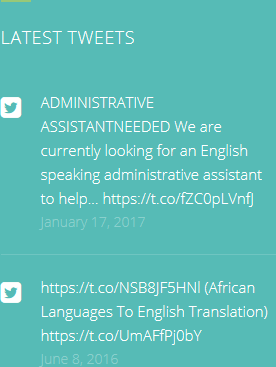 Is It Possible To Find French To English Online Translation For Legal Documents? Now that we've covered why you need a legal English to French translation expert when it comes to French to English translation of such text, now it's time to consider what good French to English online translation legal services provide. Obviously, good legal translator services need to have a flawless understanding of legal systems involved in the translation. In English common law, for example, 'equity' is a rather unique concept and doesn't quite translate to other legal systems. A translator with little knowledge of English common law would not translate this concept easily. Then there's getting the more quotidian dictionary terminology correct. Translators need to understand complex legal terms in all their languages – not just their mother tongue. It takes years to learn and develop this knowledge and it's why you will find that there is a premium charge on translation of legal documentation. But it's not just what is being literally translated or the 'realia'; it's also important to translate the 'tone of voice'. For example, legal dictionary English is full of formalities written in a passive voice; whereas dictionaries in other legal systems use a more active voice. Not being able to grasp these subtle differences can lead to confusion and misunderstandings. Lastly, certification of translations can be an issue. If a French to English translation online provider is working on legal documentation that has already been certified in its home country, how can the translation then be certified in other languages and countries? Thankfully, this is an issue that you don't need to worry about if you use the specialised legal translation services at HQ-Translators. 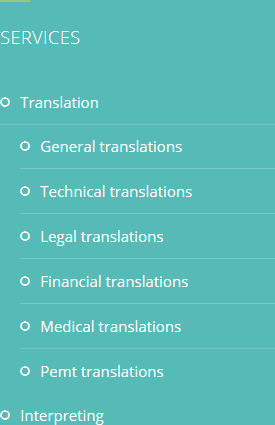 Our team at HQ-Translators understands how important proper translation of legal documentation can be. Loss of money, confusion, lawsuits – all things that can come from poor translation services, basic Google Translate, or via a Collins Dictionary. It's why we source and find the best native language translator to suit each translation request – including legal translation. We have prior experience in sourcing and providing perfect French to English translation for legal text, legal books and more. To find out more about our fast, professional translations service, just visit us online at https://hq-translators.com. 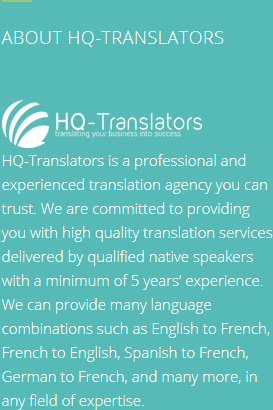 To talk to our supportive customer service translator team, phone (00 237) 242 71 38 38 or email infos@hq-translators.com. HQ-Translators is the only professional translations solution you need for your legal translation quandary.